With a range of sizes from 10mm to 100mm diameter Robson Scientific sintered discs are available in porosity 0-4. The Key to success when working with sintered discs is selection of the right porosity. 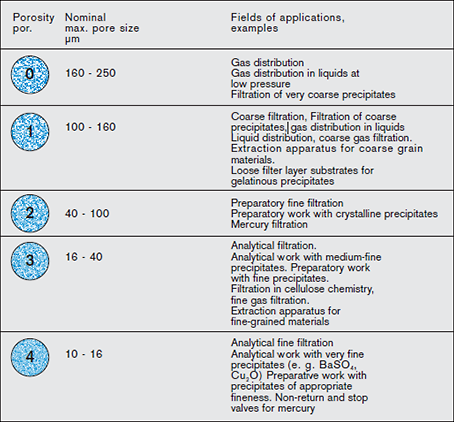 The table below shows the porosity ranges and the main fields of application for each grade. The pore size indicated always refers to the largest pore in the disc. This also indicates the diameter of the smallest particle retained during filtration. Porosities are determined using the Bechold bubble-pressure method which has often been described in literature. To achieve rapid filtration it is necessary to produce as many "passage" pores as possible without dead-ends or enclosed hollow spaces. Quartz Sintered Disc 10mm dia. Quartz Sintered Disc 20mm dia. Quartz Sintered Disc 30mm dia. Quartz Sintered Disc 40mm dia. 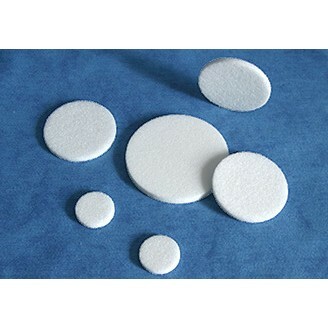 Quartz Sintered Disc 50mm dia. Quartz Sintered Disc 60mm dia.